It’s that time of year again. I’m getting “what do I do now that I have my little seedlings” questions from friends and family. 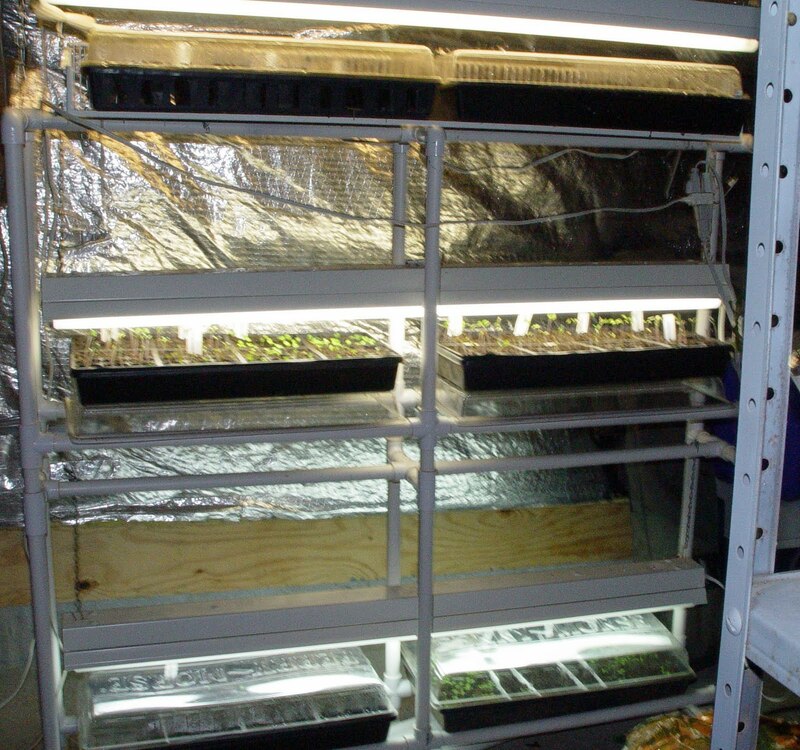 Since I started this blog to share what I’ve learned along the way and hopefully others will chime in via comments, I’m posting how I deal with seed starting and transplanting. There are probably as many ways to start seeds as there are kinds of seeds. I will only cover 3 of them here; under lights, winter sowing and direct sowing. I have an earlier post about winter sowing and will only add a footnote here. My winter sown seeds sprouted at about the same time as the ones that I panicked and started around March 1st under lights in my basement. The pictures here were made on March 14th. Basement ones took from one to two weeks to germinate and honestly, I will probably not do winter sowing next year because the basement is faster and I am impatient. 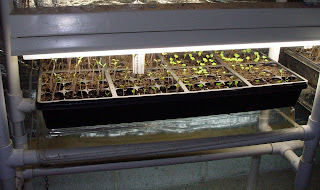 If you don’t have the space and don’t want to look at the light shelves in your house, winter sowing is the way to go. 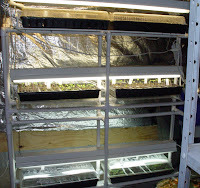 Under lights: I use the seed starting flats with the plastic “greenhouse” tops. I save these year to year, even the liners that hold the seeds. I wash these out with a mild bleach solution before I store them to keep from spreading fungus, etc. Here is a picture of my shelves that Bill made for me out of PVC pipe. I store it in the basement but you could actually take it apart and store somewhere until you need it again. The plans were from the very first issue of Garden Gate Magazine. If anyone is interested, i might post the plans. I have built a couple of these over the years and they work great. I use cheap shop light fixtures with one warm and one cool spectrum florescent light tubes in each fixture. 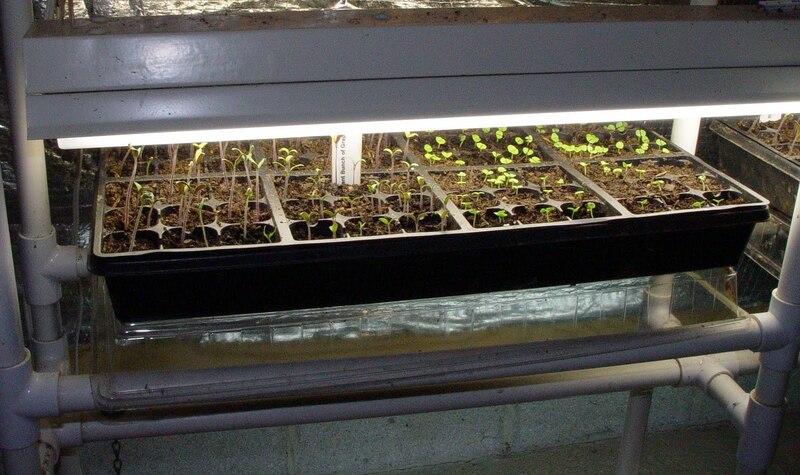 Hang the lights as close as possible to the sprouts and gradually raise them as the plants grow. I usually take the greenhouse tops off when my plants have one set of true leaves. Direct sowing: If you have the patience to wait until a couple of weeks before your last frost date, you can sow your seed directly in the garden. Some seeds can only be sown this way. Carrots for instance, don’t transplant very well – read your seed packet for information about this. Cool weather crops like lettuce, spinach, radish, etc. will do well if sown as early as late January or February here in zone 6b. I planted lettuce in big pots on my deck this year in late January and today (March 31) I have pots full of inch tall seedling out there. Again the back of your seed packets will give you all in the information you need for this. When your seedlings (planted inside or winter sown) have their second pair of true leaves, I will carefully pick them out of the seed trays, A kitchen fork works well for this, and pot them into 3 inch pots. As soon as the weather warms up to around 50 degrees I start hardening them off by placing them outside in a shady place a few hours everyday and after about a week of this, I move them into the sun for a few hours each day. Don’t let them dry out but don’t drown them either. Evenly damp is good. Also, take them in each night in case of a drop in temps below 40 or worse - a surprise frost. As soon as your last frost date – here in Mid Tennessee, it’s April 20, you can plant them in their permanent place in the garden. I have found that my plants do much better if I harden them off. There is much less rick of wilt than if I take them directly from the flats to the garden. I remember my Dad’s tomato plants in their little pots all lined up on the front porch rail every day and setting on the floor inside by the door at night. Maybe this will help those of you who are first time gardeners or first time seed sowers. Anyone out there with additional information please chime in.